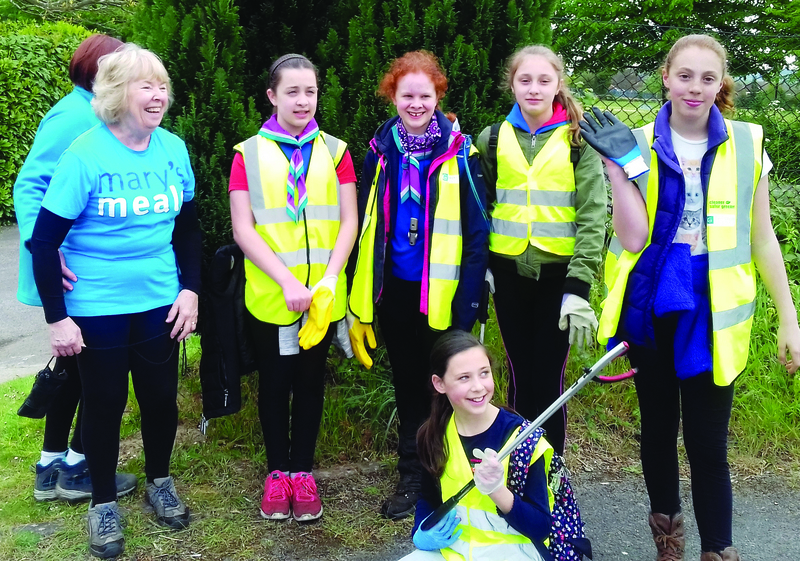 INTREPID members of the 1st Pyrford Guide Unit raised more than £100 on a long-distance litter pick in aid of a charity which feeds needy children in developing countries. Just before dawn on Saturday 29 April, three Guides set off from the Arbor Centre in Pyrford on a 10-mile walk, accompanied by Guide Leader Julia Cogan and Leader in Training Bethany Browne. After an initial five-mile loop, they returned to the centre for a “pit stop” and set off again on a second five-mile loop, joined by two more Guides and keen supporters of the Mary’s Meals charity, Elaine Evans and Fran Bunting. Three of the girls’ mothers also walked part of the route. The group returned triumphantly at the end of their trek, having raised well over £100 in sponsorship and carrying three large bags of litter. The Guides chose to support Mary’s Meals after hearing a talk by Elaine Evans. The charity provides meals for schoolchildren in 14 countries around the world. Leader Julia Cogan explained: “Mary’s Meals aims to give children who would otherwise go hungry a meal when they go to school. “The girls were enthusiastic about doing something to help and came up with the idea of a sponsored walk. They wanted to start early in the morning because girls in the poorest parts of the world often have to fetch water before dawn. Elaine commented: “I was hugely impressed by the good humour and enthusiasm shown by the girls. They were singing together as they marched along, just as the girls do when they fetch water. 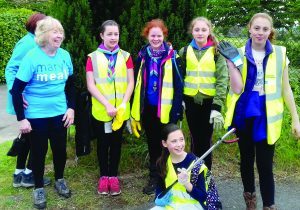 The Girlguiding Commissioner for the Pyrford Wey District, Barbara Wilson, said: “Fostering in girls the ability to find their own ideas and have the self-confidence to put them into practice successfully is a major goal of the Girlguiding movement.